Not In My World is the third album from Oakland, California-based band She Mob, whose 1999 debut album “Cancel the Wedding” garnered critical raves from Greil Marcus and Robert Christgau. 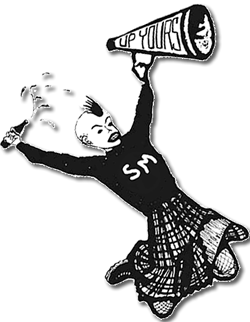 The band, a woman-led group of 40-somethings, came of age in the punk era, inspired by early Rough Trade girl-punk bands. She Mob has been called a “chick Ween,” and spews an iconoclastic, idiosyncratic mix of real-life stories and dream-inspired multi-genre songs that alternately screech, rock, haunt, amuse and confound. 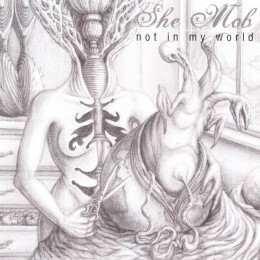 Not In My World represents a new direction for She Mob, with the addition of Suki O’Kane from the California’s East Bay improv scene, and a new batch of songs that incorporate chance operations, noise, ambiance and improvisation into the band’s punk and pop sound. In an era of emergent “Mom Rock” by older women, She Mob’s latest CD throws down the gauntlet with expressionistic songs about rage, ambiguity, Botox, cows, fairies, death, dismemberment, bad coffee, wet kittens, stains, contempt, insecurity, expired cough syrup and the Royal Tenenbaums. Not In My World features core members (Joy) Sue Hutchinson, Alan Korn (Catheads) and Suki O’Kane (Moe!kestra) in a collaborative effort with Grammy-nominated sound engineer and musician Myles Boisen (Splatter Trio, Tom Waits, John Zorn), Jeff Hobbs (Lemon Limelights, Rosen Coven) and Lisa McElroy (founding member of She Mob). Illustrations by Matthew Waldron.